Edwin Jacob "Jake" Garn (born October 12, 1932) is an American astronaut, politician, and member of the Republican Party, who served as a U.S. Senator representing Utah from 1974 to 1993. Garn became the first sitting member of the United States Congress to fly in space when he flew aboard the Space Shuttle Discovery as a Payload Specialist during NASA mission STS-51-D (April 12–19, 1985). Born in Richfield, Utah, Garn earned a Bachelor of Science degree in business and finance from the University of Utah in 1955, where he became a member of the Sigma Chi fraternity. He also attended East High School, Clayton Middle School, and Uintah Elementary School. Prior to his election to the Senate, Garn served on the Salt Lake City commission for four years and was elected as the mayor in 1971, entering office in 1972. He was the last Republican to hold that office to date. Garn was active in the Utah League of Cities and Towns and served as its president in 1972. In 1974, Garn was the first vice-president of the National League of Cities, and he served as its honorary president in 1975. Garn was first elected to the Senate in 1974, succeeding retiring Republican Wallace Bennett, father of later Senator Robert Bennett. Garn was re-elected to a second term in November 1980 with 74 percent of the vote, the largest victory in a statewide race in Utah history. 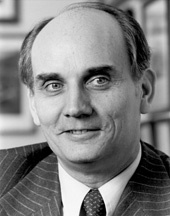 Garn was re-elected a second time in 1986. As Chairman of the Senate Banking Committee, Garn was co-author of the Garn–St. Germain Depository Institutions Act of 1982, the law that partially deregulated the savings and loan industry and attempted to forestall the looming Savings and Loan crisis. Garn asked to fly on the Space Shuttle because he was head of the Senate appropriations subcommittee that dealt with NASA, and had extensive aviation experience. He had previously flown a B-2 Spirit prototype and driven a new Army tank. STS-51-D was launched from and returned to land at the Kennedy Space Center, Florida. Its primary objective was to deploy two communications satellites, and to perform electrophoresis and echocardiograph operations in space in addition to a number of other experiments. As a payload specialist, Garn's role on the mission was as a congressional observer  and as a subject for medical experiments on space motion sickness. At the conclusion of the mission, Garn had traveled over 2.5 million miles in 108 Earth orbits, logging over 167 hours in space. The Jake Garn Mission Simulator and Training Facility, NASA's prime training facility for astronauts in the Shuttle and Space Station programs,  is named after him. Upon his return, he co-authored a novel entitled Night Launch. The book centers around terrorists taking control of the Space Shuttle Discovery during the first NASA–USSR space shuttle flight. It was published in 1989. ^ "Payload Specialist Astronaut Bio: Jake Garn". National Aeronautics and Space Administration. May 1985. Retrieved February 16, 2011. ^ "Newsmakers". Kentucky New Era. Retrieved February 16, 2011. ^ "THE NATION; Congressmen; Draw the Line at; New 'Hit List'". The New York Times. June 7, 1981. Retrieved May 24, 2016. ^ Jacobsen-Wells, JoAnn (November 24, 1989). "Demo Chief Chides Owens for Defending Garn". Desert News. Retrieved October 13, 2014. ^ a b Walker, Charles D. (April 14, 2005). "Oral History Transcript". NASA Johnson Space Center Oral History Project (Interview). Interviewed by Johnson, Sandra. ^ a b Dubbs, Chris; Paat-Dahlstrom, Emeline; Walker, Charles D. (2011). Realizing Tomorrow: The Path to Private Spaceflight. University of Nebraska Press. pp. 79–80. ISBN 0-8032-1610-6. ^ Evans, Ben (2006). 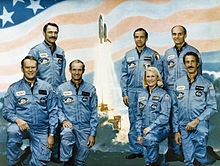 Space shuttle challenger: ten journeys into the unknown. Springer. pp. 168–169. ISBN 978-0-387-46355-1. OCLC 131057274. ^ Lamar, Jacob V., Jr.; Hannifan, Jerry (April 22, 1985). "Jake Skywalker: A Senator boards the shuttle". Time. Retrieved April 13, 2011. ^ "Jake Garn Simulator and Training Facility". NASA Cultural Resources (CRGIS). NASA. Retrieved April 22, 2011. ^ a b c d e "Edwin Jacob Garn." Contemporary Authors Online. Detroit: Gale, 2001. Gale Biography In Context. Accessed July 11, 2011. United States Congress. "Jake Garn (id: G000072)". Biographical Directory of the United States Congress.